The Funky Felter: Two Contest Giveaways to enter means Twice the Fun! It is your chance to win some of my handmade felted goodies! Two Contest Giveaways to enter means Twice the Fun! It is your chance to win some of my handmade felted goodies! This week my creations are being featured in two giveaway contests. One is at Simply Sentimental The Blog and the other is at Neato Stuff. Thanks to both of those great sites for hosting contests that include my felted creations! Please read below for more details and click on the images to go directly to the contest posts. 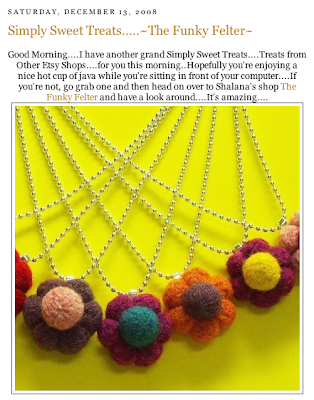 This contest at Simply Sentimental The Blog is for a custom color felted flower pendant with chain. You can enter to win through this Saturday, December 20th. Please click on the link above for complete details on how to enter. 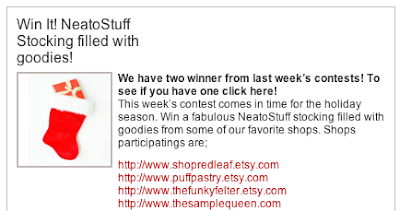 This contest at Neato Stuff is for a stocking full of holiday tems. My bright red felted heart ring is just one of many included in the stocking. Please click on the link above for complete details on how to enter.